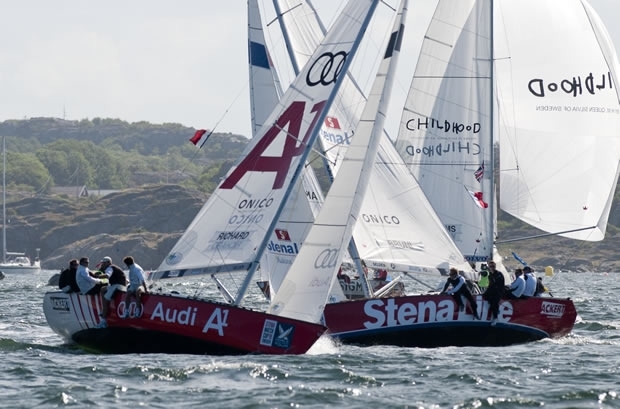 The wind switched on early for day one of Stena Match Cup Sweden. The 16 teams were separated into Groups A and B with flights concentrated into one morning race session. Five fast flights were completed in a stable 15 knots with stand out scores from Mathieu Richard (FRA) French Match Racing Team and Ian Williams (GBR) Team GAC Pindar on a clean 4-0. Torvar Mirsky (AUS) Mirsky Racing Team and Damien Iehl (FRA) French Match Racing Team are next up at a respectable 3-1. The Swedish contingent experienced a brutal day afloat, both Johnie Berntsson (SWE) Berntsson Sailing Team and Björn Hansen (SWE) Hansen Global Team are yet to score having lost all four of their races to date. Ben Ainslie (GBR) TeamOrigin and Francesco Bruni (ITA) Azzurra are tied at 2-2. While Peter Gilmour (AUS) Yanmar Racing and Adam Minoprio (NZL) ETNZ/BlackMatch Racing are both in a precarious position testing their fans nerves currently in cliff hanger spots at 1-3 which could see either of these Tour card holders leave Stage 5 earlier than anticipated. Williams smiled his way back to the dock and ran through his final match of the day where he slammed a win over Gilmour: “We actually lost 3 out of 4 starts and in the last match against Gilmour we were behind up the first beat, he got good pressure out of the left to get ahead of us. I guess with Gillie having done well on the left we thought we would give it a try on that side and it came out well for us, we managed to get back into him and get a piece of him on port and then they put a leebow tack in onto port underneath us and we were then able to lift to windward. We got very close to the windward mark and he did a big luff and then we did a couple more luffs. When we eventually peeled away we did a slightly nicer job of the speed build and managed to cross him on port when we came back together at the top mark. We were then in the lead and defended from there”. Ian Williams also caused some ructions in his match against Ainslie where he snuck past the triple Olympic gold medalist who finished in bottom position at Stena Match Cup Sweden last year. A bad spinnaker drop from Ainslie’s team allowed Williams to sail around the outside as they exited the mark which forced Ainslie to tack away. TeamOrigin Bowman Matt Cornwell then spent much of the second beat untangling the spinnaker. Ainslie commented on his equipment malfunctions today: “We had a couple of problems with the boat, the jib halyard wasn’t holding upwind and then we had an issue with the spinnaker at the bottom mark in the match against Ian which was a bit to do with the halyards and also user error. It was a frustrating race because we had a nice lead over him and we should win those but it happens sometimes”. A fatigued Richard, who is currently 17 points clear of Minoprio, on the World Match Racing Tour Championship leaderboard, commented after racing: “I don’t know if this will be another big points scoring event for my team yet because today it is just the beginning and in match racing the beginning is not as important as the end of the event. But it is always good to start well because with this format you need points at the start if you want to go through to the quarters. It will be tough for Minoprio I think for instance and this is why it is good to start well as there are only 4 spots in our group for the quarter finals”. Bruni who has been in back to back match racing events since the start of the season thought that he hadn’t quite peaked in the performance stakes yet this week, “So far Sweden has been pretty good for us, we are on 2-2 so can’t complain. We had good starts out there but we missed a point against Richard due to a mistake from my side letting him get to the right of us, after which he managed to get a penalty on us. Apart from that it was good we always had good leads at the start. For this event we all want Richard to not be in the top 4 but that doesn’t mean we don’t want to play against him at all. It’s just a pity that we wasted a point against him in Portugal, but there is nothing we can do now, we have to move forward”. The round robin stage at Stena Match Cup Sweden is considerably more pressurized than at previous Tour events. In each group of 8 teams only 4 will go through to the quarters resulting in seriously ramped up aggression in all the Swedish matches to date.